WARNING: Spoilers ahead for those who haven't seen the movie. I'm certainly not one to criticize the rewriting of mythology since my novel, Task Force: Gaea, does that by tweaking Greek mythology. After all, people spread myths by word of mouth before they did so in writing, so changes invariably happened. In fact, depending on whether you ascribe to Hesiod or Orphism, you get a variety of myths on the same subject. Keeping this in mind, I watched Wrath of the Titans, the sequel to the 2010 movie, Clash of the Titans. 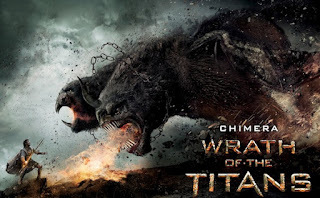 Now, being a tremendous fan of the original movie (Clash of the Titans) with Harry Hamlin, I remember feeling somewhat let down with the remake two years ago, as the latter changed some of the aspects of the original that I enjoyed tremendously. The fact that Perseus ended up with Io, a character not in the original movie at all, was a deep disappointment. He was supposed to be with Andromeda, the princess of Joppa. I enjoyed the remake's technological superiority over the original, however, but I did miss Ray Harryhausen's monsters. Yeah, call me nostalgic for stop-motion animation. This sequel had much the same flavor as the 2010 movie, and the special effects didn't disappoint. Chimerae dropping out of the sky looked more real than Harryhausen's type of creatures, although they weren't the chimerae I'm used to. 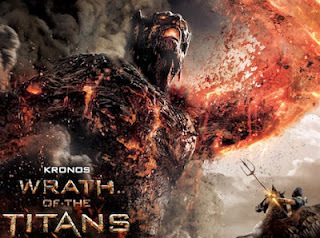 Again, Sam Worthington plays Perseus, son of Zeus, king of the gods (played by Liam Neeson); Hades (Ralph Fiennes) and Poseidon (Danny Huston) finished the trio of the sons of Kronos. Ares and Hephaestus were the only other gods present in the movie, and they seemed pretty well cast (although Hephaestus always struck me as an older, muscular god (he IS the blacksmith of the gods, after all), with misshapen legs, since he was cast down from Olympus when he tried to intervene in a fight between his mother, Hera, and Zeus, and his legs were broken. But, that's more THE mythology than the movie. As a mythological story, the movie certainly entertained me, and seeing Kronos as more of a primordial creature of magma and earth makes sense since he is a son of Gaea. The letdown? He was the ONLY Titan in the movie. Plenty of monsters appeared—the Cyclopes, the Chimerae, the Makhai, and a Minotaur—but no additional Titans showed up. Now in the original Clash of the Titans, one of the Graeae (Grey Women) whom Perseus seeks says that it would be "A Titan against the Titans!" when she's referring to Medusa's gaze against the Kraken (Medusa and the Kraken weren't Titans, actually. Medusa was a Gorgon, and the sea monster Perseus defeated was a Cetos). I know it seems like I'm nitpicking, but the Titans were a distinct group of deities. Anywho... I found the movie to be a good distraction from whatever I was planning to do today, but I'm a sucker for Greek myth-inspied movies. Seeing Perseus step up to battle Ares made me pay more attention just so I could see how that melee would finish. Ares holds Zeus' thunderbolt, the third weapon forged by Hephaestus that Perseus needs to form the Spear of Triam (the other two components being Poseidon's trident and Hades' pitchfork), the only weapon that can defeat Kronos (whose siege of the world of man was underwhelming; he basically stays in one spot the entire time, shooting magma and fire—granted, he's HUGE.) The Mahkai do rampage Andromeda's troops, that is until Zeus and Hades decide to team up against dear ole Dad. 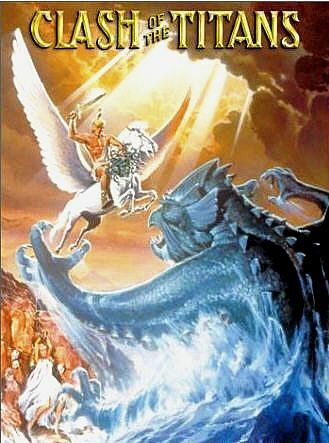 This was very much a "twilight of the gods" movie, and I don't see a third coming down the pike, but I could be wrong. It would hardly be a movie of epic/mythological proportions without the gods, however. Worth watching for the fantasy elements and some of the mythology, but some discrepancies that irked me.